I think the key to turning things around at home is establishing a physical presence and dictating the flow of the game. I am not an X's and O's visionary but I do know that when we finish our checks and don't let the other team out-hit us, we are successful. This is something that the K's can control. This is something that our coach should be able to easily fix by setting the expectation in the locker room. The other area that I think will be the key to the rest of the season is our power play. In Kalamazoo, we had a chance to put them away in the 2nd period. We were on the PP for most of that period but failed to score. Yes, we won the game, but that will come back to haunt us; especially if we make the playoffs. It is so frustrating to watch other teams dominate us on special teams. I think our PK is far too passive as well. The teams that have a good PK unit are aggressive and pressure the puck. Their defensemen still hit in the corners when they get the chance. We sit back and apply no pressure whatsoever. It's not too hard to figure out that if you let the other team, skate and pass at will; eventually they will find an opening. The last concern I have is our lack of size. I think that we are probably the least physical team in the league and I hope that the constant pounding that our small forwards are taking doesn't take it's toll and wear them down as the season gets near it's end. K's are on a good roll and they guys are giving their all every game. If we can get our special teams figured out and add a little more size, we should be in good shape. I'm not sure how to put this without sounding like I'm criticizing. Still, here are some facts backed by the statistics. Not counting goaltenders, teams in the ECHL can play with only four "veterans" per game. Lets examine, for a moment, the current state of our veterans focusing on scoring. Brett Smith--------40 games----9 goals-----24 assists---33 points. Colin Chaulk-------19 games----2 goals-----15 assists----17 points. Brent Henley------37 games----1 goal--------9 asssist----10 points. Tyler Butler-------44 games----1 goal--------9 assists-----10 points. Totals---------------140 games---13 goals----57 assists-----70 points. Now, Chaulk has been hurt for a long time and isn't expected to play for another three weeks, Henley was called up to Lake Erie of the AHL and his return is questionable. I know, and I mean I know, that players contribute in various ways. Leadership, experience, are important parts as a team is put together. As Bob Chase would say, "no doubt about it". Still, this teams is pretty bad on the power play, pretty bad on the penalty kill, and just can't seem to put the puck in the net. 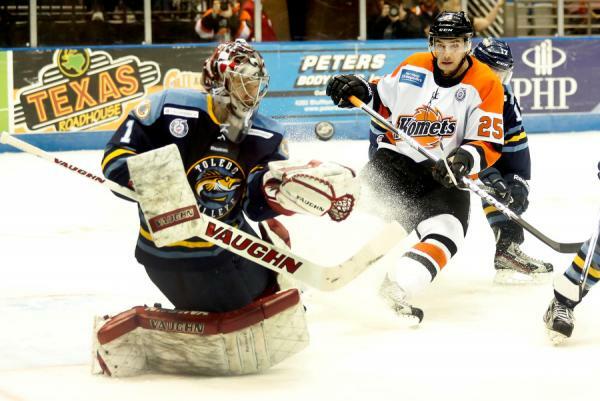 The goal differential for the year is way on the minus side, and if reversed, the Komets could have had a completely different look in the standings. I hope Syro will have a positive effect. We'll see. I have posted before that sometimes a tweak in the lineup can have a major effect on the team. If Syro works out it would be fantastic. I think the Komets need a stay at home defenseman, and an offensive defenseman. If you count Henley as gone, you have a veteran spot to fill. My take on all this is, stay out of the box, get in front of the net, and rarely shoot outside of the faceoff dots. This team is great on the road, has a wonderful record in one goal games but is going to leave us wondering how good they could be with more scoring.